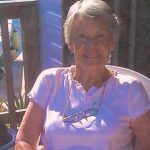 SEAFORD, VA – Gertrude “Trudy” Byrne Dickenson, AKA Queen B and (more commonly) B-Baw, died peacefully on Saturday, January 26, 2019, at her home, surrounded by her beloved family, AKA her Court (and in some cases, Jesters). Trudy’s adoring husband of 44 years, James E. “Ed” Dickenson, her beloved brother James S. “Jimmy” Byrne, her first husband John L. Albrecht, and her parents, James and Lillian Byrne, all preceded her in passing. Trudy is survived by sister-in-law Marianne Byrne; sisters- and brothers-in-law Jean and Bob Carden, and Betty and Clay Leonard. And, of course, her surviving Posse: son John Albrecht (also her primary and loving caregiver); daughters and sons-in-law Kathy and Mike Lehmkuhler, Patti and Randy Hutchison, Donna and Tod Lewis, Stacey and David Knox, and Jennifer and Brian Waymire; 16 grandchildren and 9 great-grandchildren. Trudy was born in Teaneck, New Jersey, and raised in nearby Rochelle Park. She was a proud member of the Irish clan O’Byrne, who descended from Bran mac Máelmórda, King of Leinster. The O’Byrne’s, whose motto was Certavi et Vici (I have fought & I have conquered) were famous as fiery, courageous fighters, who were proud of their Celtic heritage and defended their land and culture to the end. In fact, Wicklow County, where Trudy’s grandfather was from, was the last county in Ireland to surrender to the English! Ironically, Ed was an English descendant. The difference between her and her ancestors was she never surrendered to Ed. Trudy was an excellent seamstress who made not only her own clothes, but almost every formal dance dress her daughters ever wore; some hits, some misses. She was an avid gardener, indulgent feeder of birds, extremely smart, and had a wicked sense of humor. But most of all, she had the kindest heart of anyone on the planet. That lady never met an enemy; to know her was to adore her. And while she had many hobbies and attributes, her greatest love was her family. While Ed may have been the Patriarch of the family, Trudy was the Matriarch (AKA Boss). She was so proud of each person in her family and made each of us feel so special for our uniqueness. Trudy was also a true lover of life, even at the end when she was bedridden. Not once did she complain of her situation but instead happily accepted it, and even often joked about it. She was and will continue to be an inspiration to all who knew her, and she will be deeply missed. The family would like to give a special shout out to her many caregivers: John Albrecht, Lesley Carter, Shirley Reyes, Emma Fauntleroy, Marion Gore, nurse Jessica and all the staff at Virginia Health Services Hospice Care, as well as the many nurses and doctors at York Convalescent Center, Warwick Forest, Riverside and Mary Immaculate Hospitals, who all naturally fell in love with our angel.